Where you see all the latest life size moving-pictures. Moral and refined, pleasing to ladies, gentlemen, and children. Before I expanded the parameters of this column to encompass all Oscar-nominated films in all categories, the rules were very simple. To be included, a movie simply had to have been nominated for Best Picture and lost. Using those guidelines, I never, ever would have included West Side Story. West Side Story is by far the winningest movie we’ve covered here to date. It came very close to a clean sweep, with only Abby Mann’s screenplay for Judgment At Nuremberg standing in the way of 11 for 11. Its soundtrack went on to become the best-selling album of the 1960s. Not just a year, the entire decade. It has been referenced and/or parodied in everything from The Muppet Show to The Simpsons to Curb Your Enthusiasm to Anchorman. And somehow, the closest I had ever come to seeing it before now was in seconds-long clips in award show montages. The Academy’s attitude toward musicals seemed to be changing in the early 1960s. The genre had been part of the Oscars pretty much since synchronized sound became the norm. Most years found at least one musical nominated for Best Picture. But only a handful had actually won, starting with The Broadway Melody all the way back at the second ceremony. But that changed in the 1960s, as musicals came to dominate the Best Picture category, winning more frequently than they ever had before or would since. It would be their last hurrah. As Hollywood fought the encroaching medium of television in the 1950s, the movies got bigger. Fancy new processes were created to help embiggen the public’s love of movies, with fun futuristic-sounding names like CinemaScope, Cinerama, VistaVision and Todd-AO. The Academy embraced the Age of the Epic with open arms, handing out trophies to movies like Around The World In 80 Days and Ben-Hur as if they couldn’t sculpt the statuettes fast enough. It was an age when even a small movie, like Billy Wilder’s The Apartment, looked huge. It didn’t take long for musicals to embrace the possibilities of widescreen cinematography. Movies like White Christmas, Seven Brides For Seven Brothers, Oklahoma!, and many more pushed the boundaries of the screen. Of course, all this extra space meant filmmakers needed more stuff to fill it with. So sets got bigger, costumes got more elaborate, and the number of dancers on screen at any given moment multiplied like rabbits. It was just as well that Fred Astaire and Ginger Rogers were aging out of the genre. By 1961, the idea of paying to see just two people dance elegantly on screen was hopelessly outdated and quaint. In many ways, West Side Story was the culmination of all this change. The play had debuted on Broadway in 1957, the brainchild of director and choreographer Jerome Robbins. Robbins recruited playwright Arthur Laurents to tackle the book and composer Leonard Bernstein to write the music. Eventually, Stephen Sondheim was brought on board to write the lyrics, resulting in a once-in-a-lifetime gathering of talent. When it came time to bring the show to the big screen, the director’s reins were handed to Robert Wise. Robbins had wanted to direct himself but the money folks at The Mirisch Company balked at his total lack of experience with filmmaking. At the time, Wise must have seemed an odd choice. He had started his career as an editor, earning an Oscar nomination for his work on Citizen Kane and was notoriously put in charge of Orson Welles’ The Magnificent Ambersons after RKO fired Welles. As a director, Wise had bopped from horror (The Curse Of The Cat People) to noir (The Set-Up) to westerns (Two Flags West) to sci-fi (The Day The Earth Stood Still) to pretty much any other kind of movie you can think of but he’d never made a musical. So it was agreed that Jerome Robbins would stay on as co-director to handle the musical and dance sequences. But Robbins’ insistence on multiple takes led to the production going over-budget and, eventually, his firing. He never directed another feature which, as near as I can tell, makes him the only one-and-done Best Director Oscar winner in history. What Wise, Robbins, cinematographer Daniel L. Fapp, and all the other filmmakers were able to accomplish with West Side Story was nothing short of extraordinary. Watching the movie, you would be hard-pressed to imagine that this material could ever be contained on stage. The sets are too big, the movement too expressive, the colors too vivid. It’s dynamic and exciting in a way that’s unique to film. And unlike too many other bloated epics of the period, West Side Story moves. It’s a long film, clocking in at around two-and-a-half hours, but there isn’t a wasted second in it. It’s a little hard to judge the actual performances in West Side Story. Certainly the dancing and physicality is remarkable across the board. But this was a time when movie stars didn’t really have to sing in musicals if the producers didn’t want ’em to, so we end up with these odd Frankenstein performances with lip-synched vocals. The movie’s big name is Natalie Wood, who had already been a star for over a decade. She was still a teenager when she’d earned her first Oscar nomination for Rebel Without A Cause a few years earlier. 1961 ended up being a very good year for her. In addition to West Side Story, she’d garner her second Oscar nod for her other movie that year, Splendor In The Grass. Even though Wood’s singing voice was dubbed by go-to ghost singer Marni Nixon and even though she’s no more Puerto Rican than I am, her performance as Maria is delicate and lovely. She hits just the right blend of sweetness and sensuality, really selling the emotion and pathos of the character. Richard Beymer as Tony isn’t quite as successful. He’s handsome and charming enough but his inexperience comes through occasionally. He just doesn’t yet have the depth as an actor to really connect with the songs he’s not singing (Jimmy Bryant dubbed his voice). He’d find it by the time he played Ben Horne on Twin Peaks (and as a Twin Peaks fan coming to West Side Story late, I should add that seeing Beymer and future Dr. Jakoby Russ Tamblyn together in this does result in a moment or two of cognitive dissonance) but back then, he seems a little out of his depth. That is definitely not the case with Oscar-winning supporting actors Rita Moreno and George Chakiris. 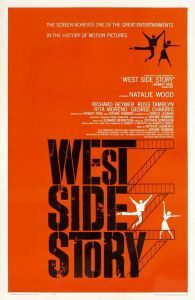 Both stars had an intensive dance background and both were sort of struggling to find their place in Hollywood when West Side Story came along. They made the most of the opportunity, especially Moreno who practically explodes off the screen. Moreno got to do most of her own singing and Chakiris did all of his, possibly just because he doesn’t get any big solo numbers. Their Oscar victories are even more impressive when you consider who they were up against. Chakiris’ competition included Montgomery Clift, Peter Falk, Jackie Gleason and George C. Scott, while Moreno was in her category opposite no less than Judy Garland. Unfortunately, Hollywood didn’t know what to do with either Moreno or Chakiris. Rita Moreno found herself unemployed for seven years afterwards, not making another movie until The Night Of The Following Day in 1968. Eventually of course, she’d go on to be one of the rare EGOT (Emmy, Grammy, Oscar, Tony) winners and an all-around national treasure. As for Chakiris (who, again, not a Puerto Rican, but certainly believable and acceptable as one), he made some pretty forgettable movies throughout the 60s before becoming a prolific TV actor in the 70s. The only nominee who went home empty-handed that night was screenwriter Ernest Lehman. Lehman was one of the great Hollywood script writers. If he’d done nothing else, his place in film history would be secured by his screenplay for North By Northwest, essentially the platonic ideal for the contemporary mystery thriller. Lehman would be nominated for six Oscars over his career, winning none. Perhaps he was overlooked this time because the Academy figured the movie was so faithful to the play that Lehman hadn’t really done much. In any event, he would go on to become the first screenwriter to receive an honorary Academy Award for his body of work in 2001, by which time he had long since retired. It’s hard to make a case against any of West Side Story‘s Oscar triumphs. At the time, the technical awards were still split into two categories, color and black-and-white. Odds are this arrangement benefited the black-and-white movies more than West Side Story, which probably would have dominated no matter what it was up against. In the Best Picture category, its only real competition was the star-studded but somber Judgment At Nuremberg. Of the other nominees, The Hustler was likely too small to make much of a dent and The Guns Of Navarone was probably dismissed as just a popcorn epic. As for Joshua Logan’s Fanny, another movie based on a stage musical that perversely decided to eliminate all the songs…nobody remembers Fanny. As they are wont to do, Hollywood learned all the wrong lessons from West Side Story. Musicals continued to get bigger and busier, eventually becoming so expensive to produce that they priced themselves out of existence. It didn’t help that musical tastes were changing rapidly in the 60s, turning big Broadway-style productions into dinosaurs. But West Side Story captured the form at its best, with a perfect storm of talent working together to bring a timeless story to life. The Romeo & Juliet template is essentially foolproof. It’s a classic, endlessly malleable story that everyone relates to on some level. When you apply this level of craftsmanship to a story this universal, the results will almost always be timeless. West Side Story is available on Blu-ray, DVD and Digital from MGM/20th Century Fox Home Entertainment.